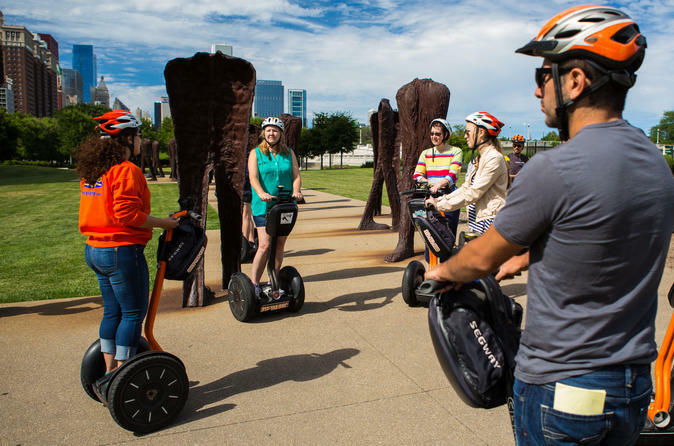 See Chicago’s landmark architecture, outdoor sculptures and famous skyline by Segway! This family-friendly guided tour is both an exciting and educational way to explore Chicago. Plus, you'll save your feet from a day of walking and instead, quickly glide along the lakefront soaking in views of the spectacular skyline while seeing some of the tallest buildings in the world. Then you're off to glide through beautiful Grant Park where you will pass Buckingham Fountain, the Lincoln Statue, and the Museum Campus. Glide around Millennium Park, 24.5-acres featuring the work of world-renowned architects, planners, artists, and designers. Continue along Michigan Avenue home of the Chicago Water Tower, the Art Institute of Chicago, and the Magnificent Mile. You'll see structures that exemplify the Chicago "School of Design" by architects including Burnham, Sullivan, Wright, Helmut Jahn, Ludwig Mies van der Rohe, and Holabird. Along the way you'll also see the Bean, the Crown fountain, the BP Bridge, and Pritzker Pavilion Band Shell. This 2-hour Segway tour is a fun and unique way to experience the the Windy City’s art and architectural sites.